There are plenty of reasons to build your own gaming rig: It’s economical, it’s fun, you’ll feel super-accomplished when you’re finished, and you can customize it down to the smallest detail—and that’s naming just a few reasons to DIY. But not everyone has the time, skill, or patience to put together an epic PC, which is why boutique custom PC makers such as Origin remain in business. Boutique shops will not only build you a PC from the ground up, they’ll overclock some of its components to boost the computer’s performance, trick out the machine with flashy accessories, and provide custom components and design features that you’ll never find in a factory-built computer. Origin is one of the best, and the company has upped its game with the new Variable Mounting technology for its Genesis full-tower PCs. What the heck is Variable Mounting? When you order your machine, you can choose to have its Asus Maximum VI Extreme ATX motherboard oriented one of four ways, depending on how you want to cool the system and which of its components you want to show off. 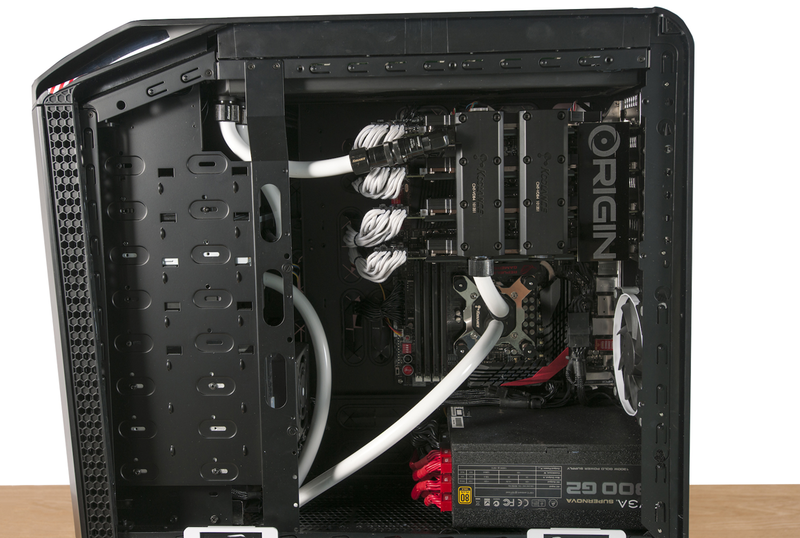 Our eval unit is liquid cooled, so Origin’s techs inverted its ATX motherboard to show off its videocards. There’s the good ol’ conventional mount, of course. But if you prefer liquid cooling, inverting the motherboard enables you to showcase the water blocks on the CPU and video cards (which are hidden when the motherboard is mounted conventionally). If air cooling is your penchant, rotating the motherboard 90 degrees orients the system’s video cards vertically, so the warm air exhausted by their fans can waft out of the top of the case. 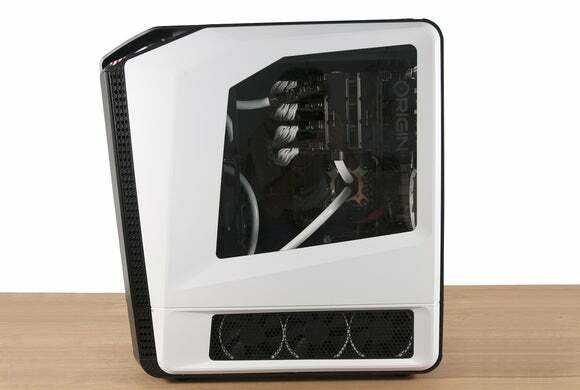 Lastly, Origin’s 90-degree inverted scheme allows the motherboard to be positioned so the case’s transparent side panel can be installed on the right side, instead of the left. It’s no slouch at productivity and content creation, either. Variable mounting applies to the enclosure’s front door, too; it can swing open to either the left or the right. And here’s another great feature: There’s a five-slot, 3.5-inch hard-drive bay with a SATA backplane. There’s no need to wrangle power and data cables, just mount a drive onto a tray and push it into the bay to make its SATA connections. The drives are even hot-swappable. Our eval system boots from a massive 1TB Samsung 840 EVO SSD, and it has a single 4TB WD Black hard drive that spins its platters at 7200 rpm. This front-accessible hard-drive bay is one of several great ideas in this gaming rig. The rest of its components don’t reside at the absolute top end of their performance class, but when a PC can deliver a game like BioShock Infinite at a resolution of 2560 by 1600 pixels (with visual quality set to Ultra) at more than 160 frames per second, packing even more horsepower would be gilding the lily—and driving up the price tag. As configured, this system is already priced at $8,365. The system is powered by the same Intel Core i7-4770K processor used in the previous-generation Genesis I reviewed in August 2013. As it did then, Origin overclocks the CPU from a stock 3.5GHz all the way to 4.7GHz. And it has Nvidia GeForce GTX 780Ti cards—not Titans or Titan Blacks—but four of them running in SLI. Strips of LEDs mounted around the inside edge of the case illuminate the interior, and you can configure them to emit 16 different colors. The video cards and the CPU are liquid-cooled, so the motherboard is inverted to show off the water blocks attached to these components. White-tinted coolant flows through clear plastic tubing, providing sharp visual contrast to the all-black interior. 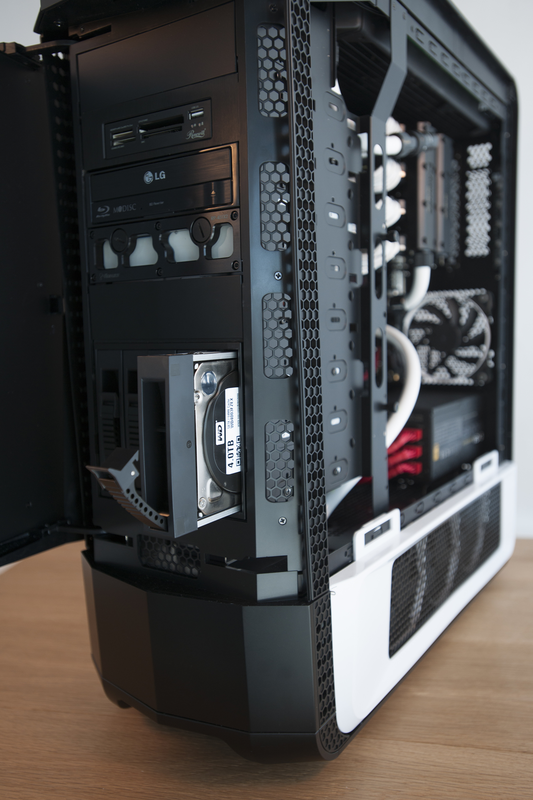 The system has two massive radiators with three cooling fans each. One is mounted at the top of the case to service the GPUs, and the other at the bottom to service the CPU. A reservoir mounted in one of its 5.25-inch drive bays has a window so you can monitor the level of coolant. A Blu-ray burner occupies another bay, and there’s a memory-card reader in another, leaving two open for expansion. Origin’s latest Genesis is 33 percent more powerful than our reference system, which has one of Intel’s Extreme Edition processors, but only one video card. The Genesis’ front-panel ports are oriented backward. This is smart, because they’re invisible from the front, even when you plug in a thumb drive, and slack cables can be routed over the top of the machine, so they don’t hang down in front and get in the way when you open and close the door. Front-panel ports include four USB 3.0, mic, and headphone, plus a button to control the fan mode (you can choose between fixed maximum airflow, or a limited range of manual control to balance between performance and noise). There’s an annoyingly small knob to make those fan-speed adjustments. Having four high-end GPUs, it’s no surprise that the Genesis leaves these single-GPU systems in the dust. 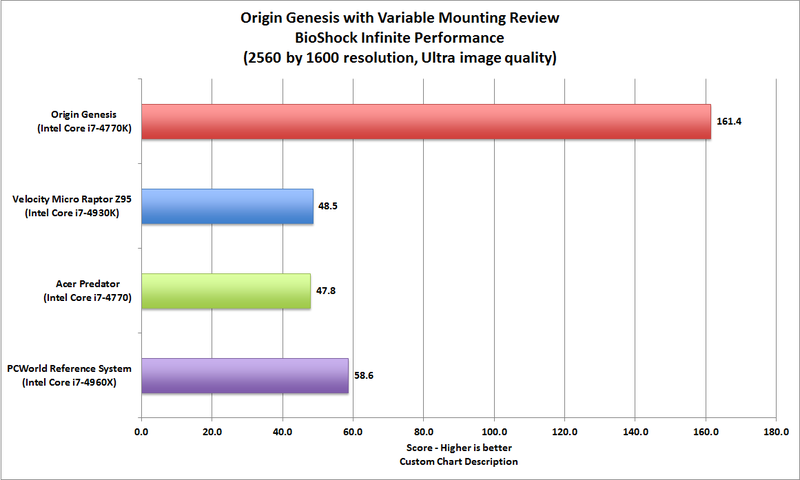 I’ve already mentioned the Genesis’ outstanding performance with BioShock Infinite. You can expect similar performance from other games. It delivered Battlefield 4 at 2560-by-1600 resolution at more than 125 frames per second, and Grid 2 at a resolution of 1920 by 1080 at more than 178 frames per second. And it’s no slouch at productivity and content creation, either, earning a WorldBench score of 133. That means it’s 33 percent faster than our Lab-built reference system, which is powered by Intel’s six-core Ivy Bridge-E Core i74960X and a single Nvidia GeForce GTX 770 video card. I applaud Origin’s innovative case design, although the tower is just a little oversized for my taste. But I have no complaints about the components the company has stuffed inside of it, nor the performance that the system as a whole delivers. 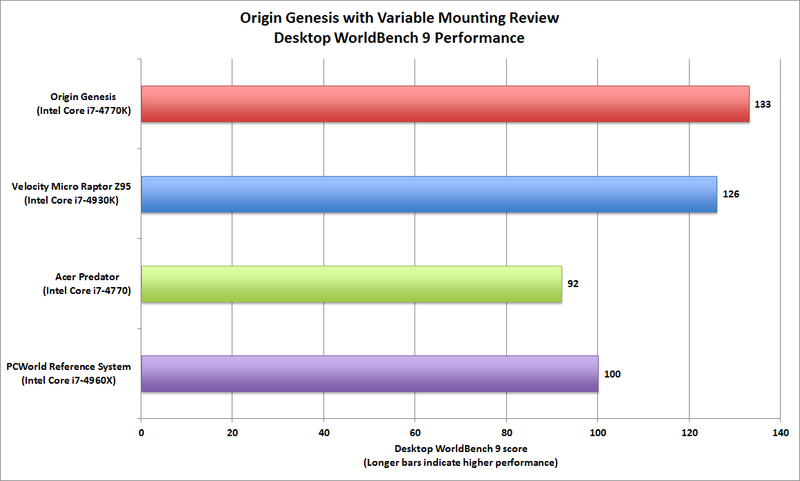 If you’re a hard-core gamer with deep pockets and a craving for out-of-this-world performance, have Origin build a Genesis for you. Origin's Genesis Variable Mounting rig defies convention with its asymmetric enclosure, front-accessible hard-drive bay, and other unique features. If you have the cash, Origin has the ideas.